This topic contains 0 replies, has 1 voice, and was last updated by Allan Burgess 1 year ago. Salmon living in the wilds of New Zealand could help repopulate a sacred river in California. Dominic Harris, for Stuff.co.nz, finds out how. Under a searing blue sky near the north bank of the Rakaia River, Caleen Sisk crouched beside a small stream and clutched a red bucket protectively to her chest. 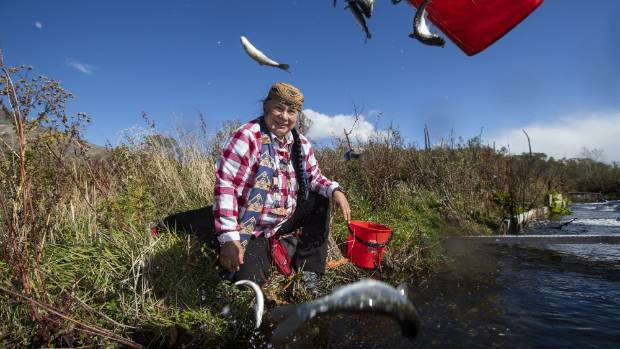 Her fingers hovered over its precious contents – dozens of juvenile chinook salmon, each little more than a hand-span in length – and she murmured a quiet prayer. 17 April 2018.